If you’ve been following me a while, or even follow my Instagram stories for a short while, you know my husband and I love Mediterranean flavors! I think we could live on Greek-ish salads of all kinds. 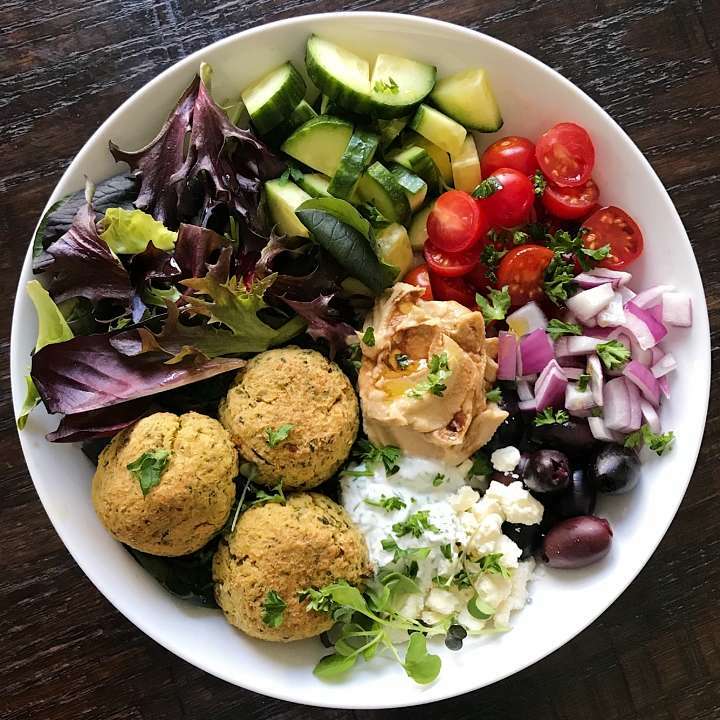 This Mediterranean Falafel Bowl takes it to the next level by adding Crispy Baked Falafels. The Falafel recipe is from The Fit Fork Feed (with a few adaptations) and it is the falafel recipe we keep going back to! Gluten-free, Vegan and packed with herbs (parsley, cilantro, garlic, scallions) and superfoods (hempseed, chia seeds, flaxseeds), they have the BEST flavor! And while they are hearty and satisfying, they are not heavy. And so easy to make! The falafel mix comes together in a food processor, then the falafels are baked to crispy perfection! Here we’ve paired the falafels with our favorite Greek-ish salad: greens, cucumber, cherry tomatoes, red onions, a big scoop of hummus (we used store bought but you could make your own hummus), kalamata olives, a touch of feta, an Herbed Yogurt Sauce for the falafels and a simple big drizzle of olive oil and balsamic vinegar for the rest. Super simple and so delicious! As a bonus: the falafel recipes yields 18 falafels so we always have extra which double for lunch or dinner another day. They can be eaten again in a bowl like this; dipped in another sauce such as a simple Tahini Sauce or Cilantro Lime Cashew Dressing (one of our faves from The Crunchy Radish) ; or even made into Falafel Tacos! For the recipe below, I’ve provided the Falafel recipe and Herbed Yogurt Sauce recipe, plus approximate measurements for one bowl. It is the type of bowl, you can add more or less of any of the ingredients and it will be perfect for you! A fresh and savory Gluten-free Vegetarian (vegan optional) meal perfect for lunch or dinner. Falafel recipe yields about 18 falafels so perfect for feeding a crowd or meal prep as they store well in the refrigerator for several days. Baked Superfood Falafel recipe adapted from The Fit ForkFeed. Crispy Baked Falafels (recipe with a few adaptations from The Fit Fork Feed), Makes approximately 18 patties or balls. Add in the rest of the ingredients and pulse until the mixture comes together. Roughly about 10 to 15 pulses. If the mixture seems too dry, you can add another tablespoon of olive oil or water. You may have to scrape down the sides as the mixture will be thick-- You want the mixture to be combined but thick and a bit coarse. Form the mixture into patties or balls, whichever you prefer. We've done both. To make the patties, form mixture into a ball then gently press down to form a patty. Spray the patties or balls with olive oil spray and bake for 25 minutes. After 25 minutes remove them from the oven and flip over and spray the other side with olive oil spray and cook for an additional 5 minutes. Can be made ahead. Store well in the fridge for several days. In each bowl, add greens, cucumber, tomatoes, onions, olives, feta, hummus, herbed yogurt sauce and falafels. Drizzle balsamic vinegar and olive oil to taste over veggies and hummus.